This 4-foot tall wooden statue brought a $500 sale on eBay! 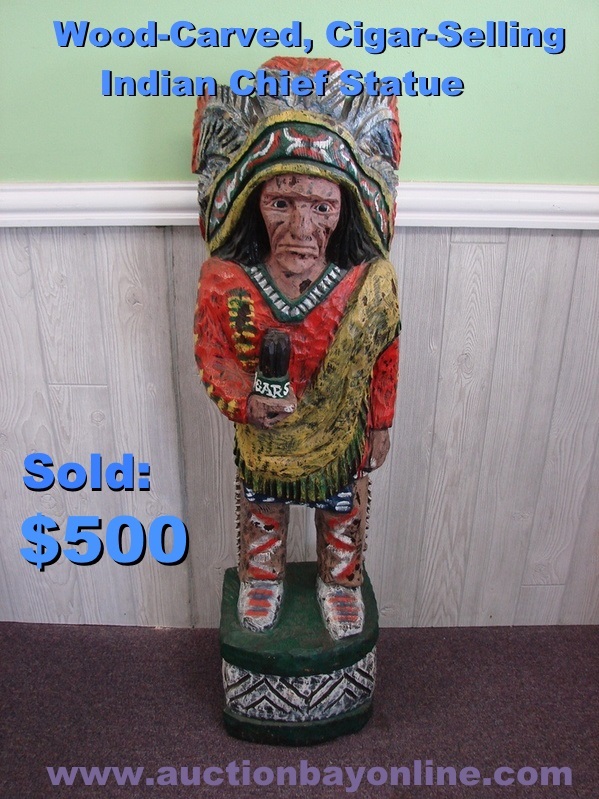 Yet another example of American Tobacciana, we are happy to share the sale of this vintage Carved Wood Indian Chief Statue, once used to advertise the sale of cigars in front of smoke shops and general stores. Decades ago, it was common to find wooden sculptures much like this one advertising wares in front of stores across the country. Not too many survive to this day, so finding one in great shape is always exciting! This model stood 4 feet tall, and its colors were still bright, so it’s sale at $500 is easy to understand! 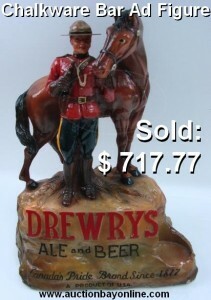 Many old advertising pieces can bring impressive prices. Items related to tobacco and alcohol are frequent high-sellers. Come in to Auction Bay to see if your item will bring in the big bucks!